Absolutely everything is provided--kayaks, safety gear (including GPS and cell phone), customized maps and transportation of everything from point-to-point. Cars will be spotted where they are needed, kayaks will be put in and taken out, your luggage will be transported from inn to inn. We even provide a disposable camera each day, and an "I Paddled the Chain" souvenir T-shirt at the end of your voyage. Torch and Elk lakes are the most famous of the Chain of Lakes. But the chain is actually made up of 14 lakes, each flowing into the next until the water rushes over the dam and the waterfalls in Elk Rapids and into Lake Michigan. 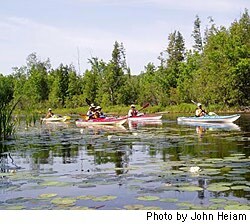 The Camelot Inn's "Paddle the Chain Kayak Voyage" takes you on the entire navigable portion of the chain--12 lakes and their connecting rivers. We have planned this route to allow you to cover a lot of water, but at a leisurely pace. Fine dining and luxury accommodations along the way make this a civilized adventure. You'll paddle through residential neighborhoods and nature preserves, past beaver dams and eagles' nests. Rental kayaks are included in the package price, but bring your own and get a corresponding reduction in the package price. The entire voyage is on flat water or gentle current. But with some open water paddling and a few tricky culverts, it's not recommended for first-time kayakers. All accommodations are non-smoking rooms with either one queen or one king bed. No children; no pets. Pricing is per couple, and assumes two people per room. Group size is limited to six. Voyage begins with a light day of paddling on Wednesday. The final day of paddling is Saturday, with a Sunday morning departure. Night 1: House on the Hill Bed & Breakfast, Ellsworth. Immaculate decor and grounds.Lake frontage, hiking trails. Night 2: Grand Victorian Bed & Breakfast Inn, Bellaire. Luxury Suite with Jacuzzi and Fireplace. Nights 3 and 4: The Camelot Inn, Elk Rapids. Master Suite or The Study. Day 2: 4-course gourmet breakfast at The House on the Hill; dinner at Lulu's Bistro, Bellaire. Casual French cuisine, extensive wine list. Day 3: Gourmet breakfast at the Grand Victorian ; Dinner at the Riverwalk Grill, on Elk River.